This is one used car purchase worth the risk. 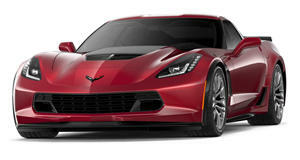 Hertz decided to celebrate its 100th anniversary last year in a few ways, one of which was to offer a limited number of Chevrolet Corvette Z06s as rentals. The company ordered 100 650-hp Z06s and now it’s time to sell them. They’ve served their promotional purpose. Hertz has now announced it will sell all 100 of those sports cars. Each Corvette Z06 features a Corvette Racing Yellow exterior paint job complete with black racing stripes and black wheels housing yellow brake calipers. Why so much yellow and black? Those are Hertz’s corporate colors. Fortunately for them, the C7 Z06 looks pretty darn good in yellow with black trim. Power, of course, comes courtesy of a supercharged 6.2-liter LT4 V8 with 650 hp and 650 lb-ft of torque. Power is sent to the rear wheels via an eight-speed automatic transmission. Yes, a manual transmission is available but Hertz only ordered slushbox-equipped Z06s. Not all of its customers can drive stick, apparently. The interiors all feature black upholstery with yellow stitching (go figure) along with special commemorative badges. There’s also a centennial plaque in each car marking the occasion and signifying each Z06 is one of 100 built for Hertz. A few other features include an 8-inch infotainment touchscreen, 10-speaker Bose audio system, and Apple CarPlay and Android Auto compatibility. The price tag for a Hertz Z06? That’ll be between $90,000 and $100,000. Not all examples are in the same condition. They were rental cars, after all. Mileage for the cars will vary. A non-Hertz Z06 begins at around $83,000 but because these are fairly well-equipped and carry special collector’s status, the price goes up. The Z06s were available for rent for around $300 daily at airport locations across the US, among them Los Angeles, Miami, New York, and Chicago. Hertz did not say when sales will get underway, but those interested are advised to keep an eye on the company’s official website to see when the cars will be posted for sale.